Sorry I've been MIA for a few weeks. Would you believe me if I told you I got abducted by Gru's minions? Well I kinda did in a way - C and I went to see The Minions movie! We haven't seen a movie on opening weekend for as long as we knew each other. Wowza. Anywho, I'm gonna breeze through this review so that I can listen to my swearing minion from my happy meal over and over again. 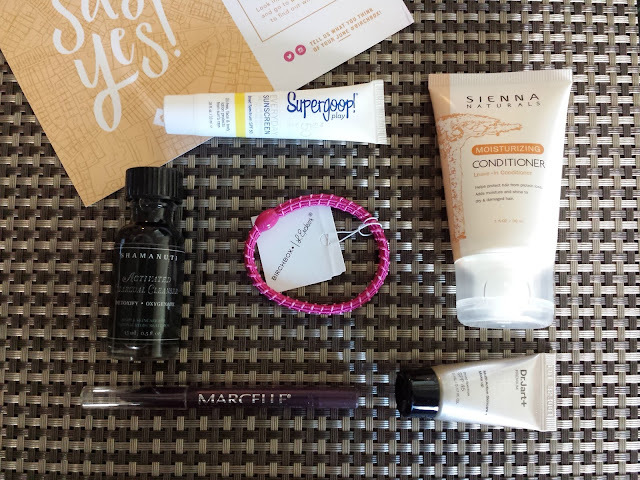 Birchbox came unbelievably late this month. So late that I got it in the wrong month. *cry cry* It finally arrived after 4th of July weekend. I didn't pick a box customization because I was okay with any of the choices except the Supergoop sunscreen because I have about a gazillion sunscreens. 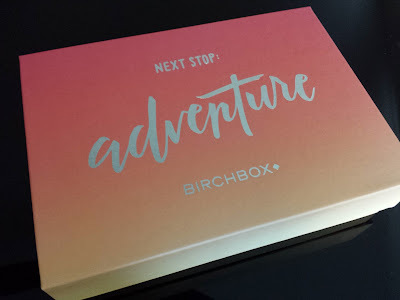 When I shook the box before opening it (because I'm a kid) there were lots of smallish-sounding stuff making lots of noise, but that's expected with Birchbox. Shamanuti Activated Charcoal Cleanser (0.5oz value: $5)- I'm gonna start with the most intriguing and probably the only thing I can honestly say I'm glad to see in this box. Have you ever noticed that there's charcoal in your water filter? Have you used charcoal to clean up a solvent spill? Why charcoal? It's because activated carbon/charcoal is excellent at absorbing chemical impurities. It neutralizes acidity and exfoliates with maple extract. Bonus: you can also use it as a shaving cream or body wash. The only downside for me is the scent - it smells pretty medicinal/aftershave-y. 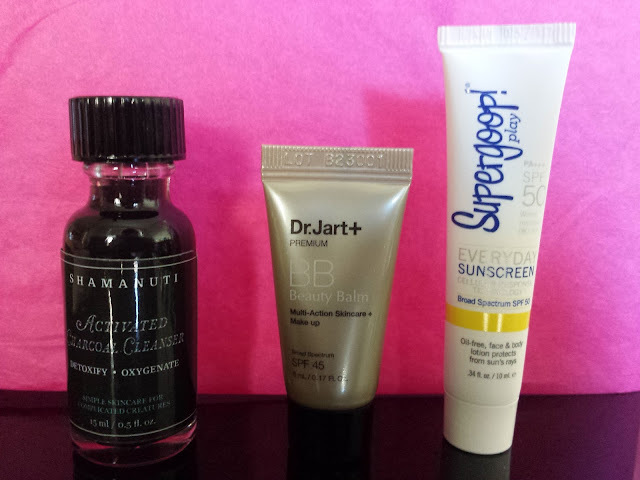 Dr. Jart+ Premium BB Cream (5ml value: $4) - I remember getting this in my very first Birchbox almost two years ago. The way I see it, if it's gonna be on my face all day, I better be able to tolerate the scent. This, however, smelled too much like sunscreen for me to like it. I still don't like the sunscreen smell so I think I have to pass this along to someone who isn't as whiny as yours truly. Supergoop! Everyday SPF50 with Cellular Response Technology (10ml value: $1) - More sunscreen! I guess that makes sense since it is summer and all. But we have four open bottles at the moment and none are anywhere near empty. That's how my boyfriend functions - if he can't find an open bottle of something within 10 seconds he goes and opens a new one without even thinking to look in a different drawer. Plus I have about 10 travel size tubes of sunscreen that he won't touch because he thinks they're too girly. Pffft. Thou shall also be passed along to a more deserving individual. Marcelle Waterproof Eyeliner - Mulberry (0.8g value: $7) - I like eyeliners. I like mulberries. But not combined, not on my eyes. This is a deep metallic purple that I'd imagine would look beautiful with light pink or silver. I just got over my fear of purple nail polish...I'm still working on accepting purple everything else, so I can't handle this just yet. Baby steps. 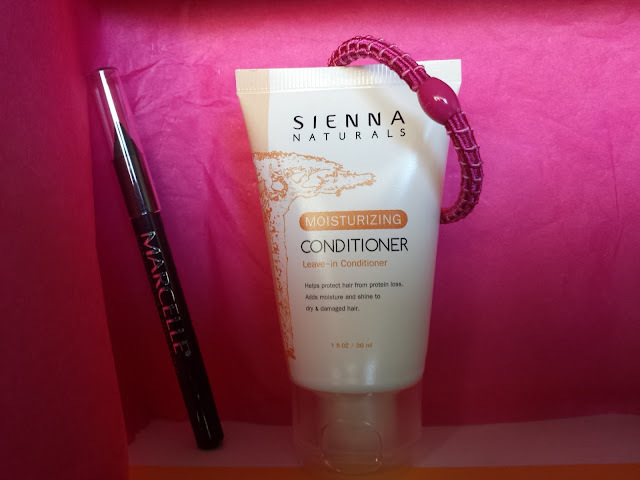 Sienna Naturals Moisturizing Leave-in Conditioner (1oz travel size value: $2) - I've always been scared of leave-in conditioners because my hair loves to get greasy every chance it gets. Even if I keep hair products far from the roots I always manage to end up with oil city on my scalp. I used this as a semi leave-in conditioner and washed it off after about 10 minutes. The expected result was moisturized hair as a result of the baobab oil, coconut oil and shea butter trifecta. The actual result was unnoticeable aside from the overpowering scent radiating from my head all day. I don't get it, it smelled yummy in the tube, but all day my hair smelled like plants. Lots of plants. But the name does have naturals in it, what did I expect? L. Erickson Narrow Grab and Go Pony Bands (single band value: $2) - These are elastic hair ties with a plastic bead containing the crimped ends in lieu of a metal band. I haven't bought a hair band with metal since the 6th grade because they were frowned upon in judo tournaments. I guess plastic is a little better since you won't cut yourself on the metal edge; unfortunately, anything rigid is isn't allowed in competition so a long time ago I discovered the completely elastic bands. Not the ones with the glued seam because those still snap (and hurt like hell when they do), but if you go to any Japanese/Asian goods store you'll find long lengths of elastic (hair gum, they call it) that you can cut and tie yourself. No seams, no hard surfaces - just a knot. I wear a ponytail about 80% of the time and I've been using the same exact elastic for the past 2 years. I luv it. So out of the six things in June's Birchbox, I'll probably end up using only the charcoal cleanser. And I guess the leave-in conditioner because I opened it already. It's not that everything in here was bad, because it wasn't, it's just that I have way too many moisturizers and eye liners stockpiled in my house. Maybe this is a sign to put beauty subs on hold until I can make a dent in my collection of a million samples? Hmm...we'll see. In the meantime, if you want to subscribe to Birchbox, you can do so here. Happy discovering!